Drainage is a way of removing content (pus, of exudatefrom the wound cavity of the body, hollow body with the help of pipes, rubber and gauze strips of gauze tampons. When draining the conditions for the permanent outflow of content. Gauze swabs and gauze strips are of limited use for drainage, as, soaking detachable, quickly lose their hygroscopicity and cease to output content. Rubber strips (for example, from rubber glove) applied in some cases in the postoperative period for drainage of wounds. By decreasing the amount of discharge from the wound clean them up. Most often used for dewatering tube made of synthetic materials and rubber of various diameters with a few holes at the end, entered into the drained cavity. Before the introduction of the drainage tube is washed, check their permeability and strength in order to avoid isolation and sterilized. The drainage tube is inserted through a wound or additional cut - contepartiro (see). To prevent the loss of the drainage tube is sometimes attached seam or a patch to the skin. Towards the outer end of the drainage tube is introduced in a cavity (peritoneum, pleura and others)put a gauze napkin that it did not go in depth. Tube-level vyhozhdeniya her wound tightly tied with a thread :when vicodinii drainage tube from a wound string will be above the level of the skin, while deep dive will not be visible. For evacuation of fluid from the pleural cavity apply siphon draining (Fig. 1). Through a puncture trocar intercostal space, in the pleural cavity enter the drainage tube, one end of which is immersed in a vessel with an antiseptic liquid. In some cases, the drainage of the pleural cavity, in order to avoid the suction of air from the outside to the outer end drainage tube put your finger on the rubber gloves with cut top, spanaisace with breath (the so-called valve drainage). To drain the kidney drainage tube is introduced into the pelvis through the wall (pyelostomy) or through parenchyma kidneys (nephrostomy). When draining the bladder drainage tube out through unblushing part of his anterior wall (Fig. 2, 1). 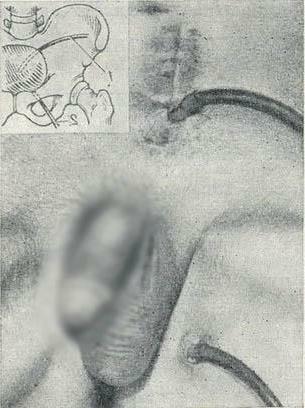 When vnebrachnyi rupture of the bladder and injuries of the urethra to prevent urinary satekov after a high cross-section of the bladder and overlay suprapubic fistula produce drainage okolopostelnoy fiber through locking hole with the removal of drainage on the inner surface of the upper third of the thigh (Fig. 2, 2). Through the drainage tube is possible to make active and drainage (see Suction drainage). Sets the drainage tube doctor, subsequent monitoring of the tube, the number and nature of the discharge, color sediment provides a nurse. After the operation, you should make sure that the drain pipe was not salivales, does not bend, do not press on the skin. You must ensure that the drain pipe was well fortified and did not drop out. Loose tube should be introduced immediately. This manipulation is carried out only by a doctor. To monitor the number and nature of the discharge (especially after operations on the organs of urination and biliary tract) it's best to omit the outer end of a drainage tube in a graduated vessel made of flint glass. With the dramatic increase in the number of discharge, change its nature nurse must immediately inform the physician. The terms of stay of drainage tubes in the wound or cavity depend on the nature of the intervention (terms of removal is determined by the doctor). Found at the bandagethat was entered into the wound drainage tube is absent, the nurse must immediately inform the physician.